By BAJA writer Christiana Lilly. First published in Art Hive Magazine. At the NYSW Jazz Lounge. Miguel Pilgram’s love story with jazz does not begin as a child listening to records. Rather, it begins on the Indian Ocean during the Gulf War. He and his fellow sailors were aboard the USS Kiska when they heard that another ship struck a mine not too far away—the water was so still on the ocean that they could feel it. Shaken by the close call, a sailor brought out a John Coltrane album, introducing Pilgram to the genre. Coltrane lead him to Nancy Wilson, Duke Ellington, Miles Davis, and other jazz greats. That light at the end of the tunnel lives in the NYSW Jazz Lounge, Pilgram’s newly opened jazz restaurant and lounge in Fort Lauderdale, flanked by other new businesses The Grind coffee shop and Tarpon River Brewing. “This is a place with energy, the jazz experience, the true jazz experience,” he said. The fourth? Restaurants. He opened New York Subs and Wings and Cheesecakes in Oakland Park in 2015, where the hungry can get a taste of New York style comfort food. From there, he expanded the business into a new concept, the NYSW Jazz Lounge—the initials carry over the restaurant venue while adding in entertainment. The interior bar is an intimate 900- square-foot space, and outside is a 1,400-square-foot al fresco bar and courtyard. The space is decorated with Edison light bulbs, paintings of jazz pioneers, powerful quotes, silhouettes of performers and dancers on the walls, and music notes. However, the stand-out pieces are the bar in the shape of a piano and stage created with a shipping container. There, the likes of Tito Puente Jr., Sabirin Yamin Mustafa, Eric & The Jazzers, the Marcus Mitchell Project, and other performers get the crowd swaying, snapping, and dancing. Once a week, the venue hosts a spoken word night. 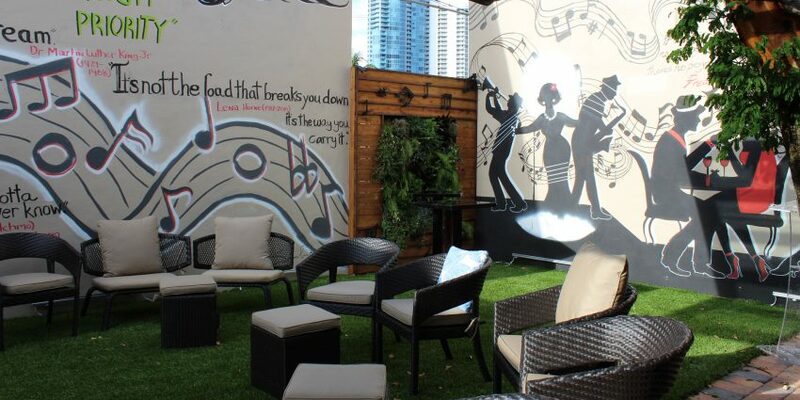 Throughout Fort Lauderdale and surrounding neighborhoods, there are plenty of places to listen to jazz—if you go on a jazz night. At the NYSW Jazz Lounge, no matter what day or time you come in, there’s jazz wafting in the air. From class to soulful, progressive, Latin, it’s all forms and tendrils of jazz on stage. And he doesn’t want to be the only one. He admires Blue Jean Blues on 33rd Street, and he hopes that with their success, other venues and entrepreneurs will see that jazz is something the people want. But Pilgram isn’t done yet. On the horizon, he has plans to open another venue, Memphis Blues, in Sistrunk to complete the musical family of jazz and blues—plus more ventures.